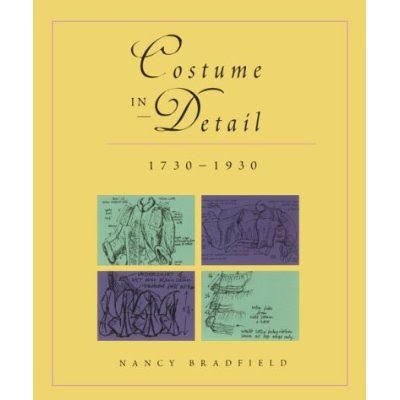 This book contains line drawings of original 18th century garments from the Snowshill Collection, there are no photographs but there are brief descriptions of each garment. For that reason alone, the book is a worthwhile addtion to the costume library. From a stay-making perspective there are three pair of stays detailed in the book. A red silk pair, laced back and front with shoulder straps, a blue silk damaskpair, laced back and front with shoulder straps and an unusual pair of green linen stays with no shoulder straps, back lacing only. There are two other pairs featured, they are both late 3rd Qtr, 18th c, both are back lacing only, one of linen and fully boned, the other with a cotton outer layer, half boned. As a fully paid up Brit, I should point out that the Snowshill costume collection is no longer held at Snowshill itself - so let me save you a trip! Charles Wade collected *everything* and his collections far outstrip space. Instead, the costume is now available for visiting and study at the National Trust's Berrington Hall.